The ChiliPad is a mattress pad with a cooling and heating temperature control system. 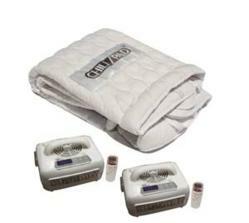 It regulates the surface temperature of your mattress so that you sleep comfortably all night long. Another reason Sleep Restfully helps you get a restful sleep. Sleep Restfully, Inc., long known for providing the finest in sleep therapy equipment and supplies, is please to announce the addition of the ChiliPad Cooling and Heating Mattress to their product lineup. Sleep Restfully continually searches for products that will provide a better therapy for the sleep apnea suffer as well as products that will assist them in getting the good night sleep that is so deserved. The ChiliPad™ is a mattress pad with a cooling and heating temperature control system. It regulates the surface temperature of the mattress so to guarantee a comfortable sleep all night long. Designed to fit all standard and extra thick mattresses, this unique 200 thread count, poly / cotton mattress pad uses soft medical grade silicone tubing to circulate regular water through the pad. A built in connection tube (48" in length) connects the pad to the control unit. Dual-zone ChiliPads have separate tubing and independent control units for each side. Control the temperature at the touch of a button either directly on the control unit or conveniently in bed with the wireless remote control. Set the temperature in 1° increments from 46°-118°F. The control unit heats or cools regular water to your set temperature and circulates it through the pad, generally achieving temperatures between 55°-110°F on the bed surface. A thermostat maintains the set temperature, letting you sleep at your ideal temperature throughout the night. End battles over the thermostat and save money on your energy bill by cooling or heating the bed instead of the entire house! The control unit averages less than 80W of energy use, and dual-zone ChiliPads let you set each side of the bed independently. Fall asleep faster and achieve deeper, restorative sleep longer by controlling the sleep temperature! Sleep Restfully, Inc. prides itself on the high quality customer service it provides to Sleep Therapy and Oxygen Therapy customers. Having a Better Business Bureau rating of “A” assure you that you can trust Sleep Restfully, Inc. They carry a complete line of CPAP, BiPAP and VPAP machines as well as CPAP supplies by ResMed, Philips Respironics, Fisher & Paykel and other manufacturers. In addition to CPAP machines and CPAP supplies, Sleep Restfully is your portable oxygen concentrator specialist offering the best prices and support for portable oxygen concentrators such as the Respironics SimplyGo, Respironics EverGo, Sequal Eclipse 3, Inogen G2, Invacare XPO2 and more. They also sell stationary oxygen concentrators such as the Philips Respironics EverFlo and Invacare Perfecto. Sleep Restfully, Inc. has been chosen as an Authorized Internet Provider for the new Philips Respironics SimplyGo Portable Oxygen Concentrator. With the addition of the ChiliPad Cooling and Heating Mattress Pad you have one more weapon in your arsenal of sleep products guaranteeing you and your partner that you will Sleep Restfully. Sleep Restfully can be contacted on their toll free number (866) 923-2727, or by visiting our website sleeprestfully.com.